Buffalo Sabres: Who Should Be Jack Eichel's Wingers? 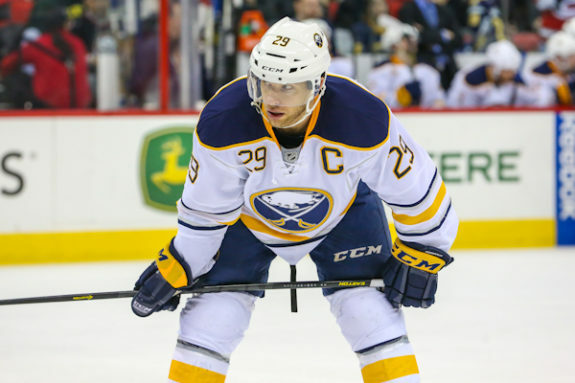 Who Should Be Jack Eichel’s Wingers? One of the first changes Phil Housley made to the Sabres’ lineup was moving Sam Reinhart to centre. Reinhart was a centre in junior and a good one, drafted 2nd overall in 2014. But when he arrived in Buffalo, Jack Eichel and Ryan O’Reilly were already established as the top centres under Dan Bylsma. Reinhart put up decent numbers alongside house-mate Eichel but lacked an edge, and consistency, on the wing. Now, Housley wants to return Reinhart to centre, which will hopefully improve his play. That means Eichel is without his most consistent wingers from the previous two seasons. Eichel played 142 minutes with Reinhart and the recently traded Marcus Foligno last year. Without them, he will need new linemates. The obvious candidate is Evander Kane. Eichel has played with Kane but as I found out in the spring, it wasn’t to great effect. Kane and Eichel combined for high scoring chances and shots but had little control of the puck defensively and gave up more chances than they created. Under Housley’s new aggressive system, Kane and Eichel could. It’s worth considering but I don’t believe Kane is the partner for Eichel. On the right side, it seems appropriate that Foligno was traded for Jason Pominville, the former Sabres captain. It was possibly a like-for-like switch, as the veteran provides poise and experience to Eichel’s line, something that’s been lacking. Pominville, however, is on the other end of the age curve. With Minnesota, Pominville averaged 14:14 minutes a night, that’s 5:41 minutes short of Eichel’s average ice time. The question is whether Pominville can keep up with those minutes or if he will become exposed by tough matchups. The idea of playing youngster Justin Bailey alongside Eichel is also a possibility. He has the speed at the NHL-level without the scoring touch, though he does possess it, with 23 goals in the AHL last year. The question is, can he develop a scoring touch alongside Eichel whilst still playing against the toughest lines. There is no evidence to prove Bailey would work, yet. But based on his ability and speed, he could play on Eichel’s left while Pominville plays on the right; a perfect blend of rookie rawness and veteran savvy. It is fairly certain that Kyle Okposo will remain with O’Reilly, whilst Zemgus Girgensons seems to have joined that group through the pre-season, so we can rule out those players. There is a chance, however, that Reinhart gets the pleasure of Pominville’s presence on his wing. Despite being a year his senior, Reinhart is much less proven as an NHL centre than Eichel and could be in need of a veteran winger, while Pominville has typically played third line minutes so the boot fits. We have also seen Kane, Reinhart, and Pominville play together this pre-season. That could be a very strong third line. The only problem being, of course, that this leaves Eichel with less-talented options. Hudson Fasching has been sent back to Rochester. Alex Nylander is completely unproven and only 19 years old. Matt Moulson’s career seems to be in a free fall. Other unproven players such as Jacob Josefson and Seth Griffith are options as well. Nick Baptiste is another winger similar to Justin Bailey. Baptiste actually played with Eichel briefly last year, even scoring his first NHL goal alongside number 15. 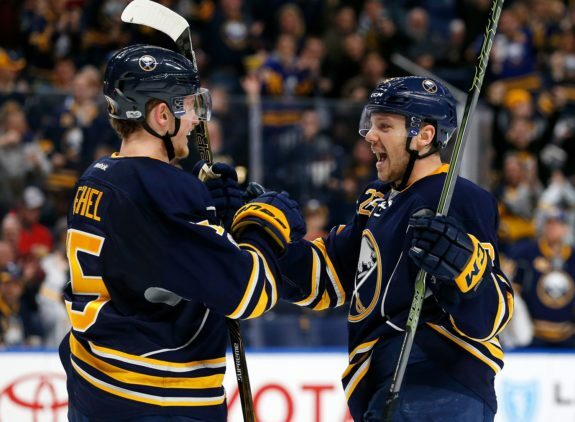 Would Eichel be able to carry two youngsters on his line who have eight points in their 54 collective NHL games? I wouldn’t think so. 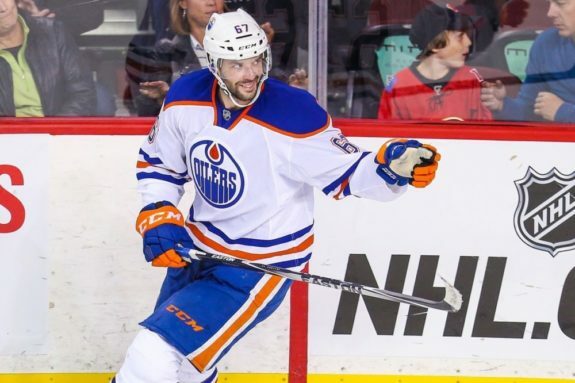 Addition by subtraction would then leave us with Benoit Pouliot, signed as a free agent this summer. Pouliot struggled with Edmonton despite putting up decent numbers inconsistently throughout his career. We haven’t seen much of the pair together so it’s tough to predict their success. Many people I talk to question Pouliot’s ability to keep up with Eichel, as the veteran’s biggest criticism is his lack of speed. I’d be surprised if Pouliot was put with Eichel full-time, though I could see Housley at least trying it out. The two players left are also fighting for the fourth line centre spot: Evan Rodrigues and Johan Larsson. Both played third line centre last year, first Larsson before Rodrigues came in as injury relief for the Swede. 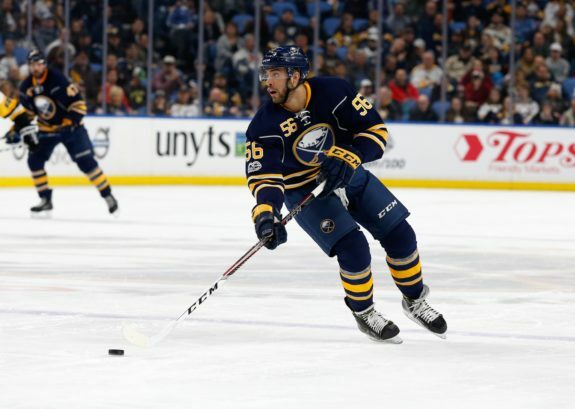 Rodrigues has become the forgotten man in Buffalo after progressing significantly at centre. He was, of course, Eichel’s winger in college and that familiarity could go a long way. Much like the rest of the list, Rodrigues lacks scoring consistency. With all the options laid out, it strangely doesn’t become any more clear who the best options would be. Would Eichel benefit from a veteran presence or rookie speed? I think it’s going to take some time before even Housley knows. Who do you think should be Eichel’s wingers? Let us know in the comments below.